Without doubt, the conference on Climate change and Global warming was a fiasco, failure and a retrograde step. It even went back on the Kyoto Protocol, held in 1997 in Japan where 37 industrialized countries committed themselves to a reduction of 6 greenhouse gases to as much as 5% of the 1990 level. 2. The conference had too many countries in participation. It was a merry mix-up with hundreds of politicians and delegates confusing the issue. This is one of the reasons that United Nations General Assembly cannot take any meaningful decisions. 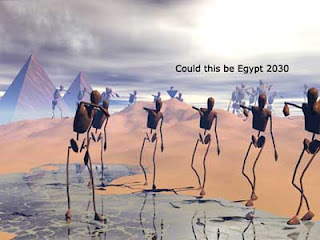 Most of them are skeptics, and do not accept anything based on scientific predictions and demand physical evidence. 3. Every politician had been warned to put the country before the Earth. Patriotism towards the country was more important than saving the Earth. However he was told that he must show concern for the Earth. 4. Every politician was told NOT to commit to a figure or, if he is pushed to commit to some small figure he should ensure it could not be verified. If he is accused of not showing concern he should indulge in a blame game. Without these “protections” he could not face the Parliament (or a Senate) on his return. 5. Most of the Politicians and delegates not having a technical background should have undergone a small scientific instruction course before attending the conference lest they talk without the desired seriousness. 6. Lastly, all the countries recognized in advance that nothing substantial will be achieved and waited for a political agreement to mess around in platitudes and show a consensus. The Heads of the big countries could spare just a day or two to get a final agreement – shows their seriousness and commitment. Why is our Earth warming up? The concentration of carbon in living matter is almost 100 times greater than its concentration in the earth. So living things extract carbon from their nonliving environment. For life to continue, this carbon must be recycled. These are caused by Greenhouse Gases than Carbon Dioxide like methane ( caused by burning forests, flatulence of cattle produces methane that is expelled, etc).Growing rice has an adverse environmental impact because of the large quantities of methane and this can be reduced by better agricultural practices like draining paddy fields. 5. Rise in Human and Cattle population. What are the effects of global warming and the greenhouse effect? 1. Weather changes. Even a small increase in the global temperature would lead to significant climate and weather changes, affecting cloud cover, precipitation, wind patterns, the frequency and severity of storms, and the duration of seasons. 3. 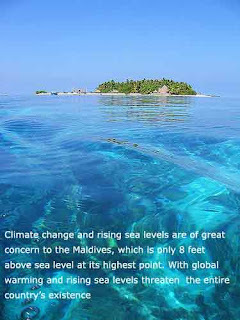 Sea levels rising: and global warming is at least part of the cause. 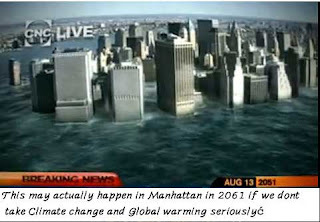 If the sea level were to rise in excess of 4 meters almost every coastal city in the world would be severely affected, Long-term changes are mainly caused by temperature (because the volume of water depends on temperature). 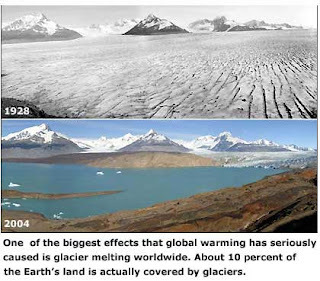 The rise is also due to melting glaciers (irreversible phenomena) caused by global warming. 4. Land. Millions of people also would be affected, especially poor people who live in precarious locations or depend on the land for a subsistence living. 1. Saving energy and Life style changes and "throw away" practices. Be frugal. Use Carpools. 2. Using Government and Media to highlight the problems and offer solutions. Pour more money into research activities for clean energy. a. Using Solar power: solar cells capture the heat from the sun and store it. 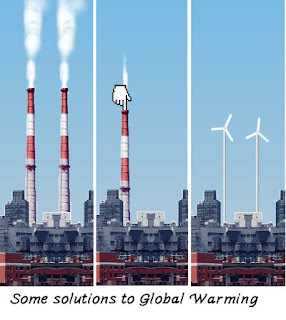 d. Nuclear energy: It is a source of clean energy but is only a temporary solution. It has the drawbacks of disastrous consequences of accident and getting rid of nuclear waste. e. Use of CFL (compact fluorescent light bulbs) for lighting. If a building's indoor incandescent lamps are replaced by CFLs, the heat produced due to lighting will be reduced. Its environmental advantages are big because of its lower energy requirement. For a given light output, CFLs use 20 to 33 percent of the power of equivalent incandescent lamps. 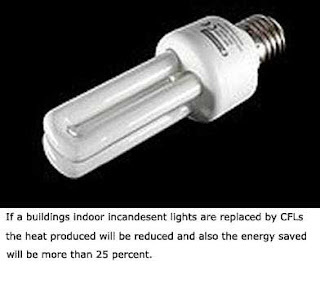 If a building's indoor incandescent lamps are replaced by CFLs, the heat produced due to lighting will also be reduced. A hydrogen vehicle is a vehicle that uses hydrogen as its onboard fuel for motive power. The power plants of such vehicles convert the chemical energy of hydrogen to mechanical energy (torque). With further research and development, this fuel could also serve as an alternative source of energy for heating and lighting homes, generating electricity, and fueling motor vehicles.